To run a successful marketing campaign, all you need is a spark of creativity and boom!! In today’s media landscape, holding your consumers’ attention and shifting their perceptions is no easy feat. However, keeping your target audience in mind and combining the power of creativity with reliable data and digital trends can help you come up with an inspirational and heartwarming marketing campaign. In 2017, we witnessed a host of audience-centric and creative marketing campaigns that worked best and left a long-lasting impact on consumers’ mind. If you are planning to launch a marketing campaign and are in need of a big dose of creativity and inspiration, here is a roundup of some of the best marketing campaigns of 2017 and lessons digital marketing agencies can learn from them. IKEA is one of those brands that got their feet wet with augmented reality to come up with more advanced and amazing possibilities. IKEA’s Place app intelligently embodies the notion of augmented reality by embracing Apple’s ARKit. The app allows consumers to actually view how a piece of furniture is going to look in their homes, providing an awesome brand experience to the consumer. Simply lose yourself in the app’s catalog of over 2,000 products – spanning the complete collection of storage units, coffee tables, armchairs, and umlauted sofas- then hold up your phone and place the digital furniture pieces anywhere you want in a room using your camera. Want to know if you really can squeeze in that 6-foot rug in your lounge? Curious if that Strandmon winged chair would go with your curtains or where that futon you are drooling over would go in your guest room?The purpose of creating this app is to help consumers make the more informed decision about their purchases, rather than let them buy ill-fitting and hard to match paraphernalia. McDonald’s sly and creative ad doesn’t-mention their brand name but smartly conveys their corporate message to their audience. The ad features a celebrity, Mindy Kaling, encouraging viewers to search the place where Coca-Cola tastes so good. The actress is a sporting sunshine yellow dress and the red background clearly depicts McDonald’s brand colors, but she doesn’t actually say the name of the fast-food restaurant. The brand intelligently leveraged the power of influencer marketing and targetsCoca-Cola consumers to lure them in and convert new leads. It’s not just a simple opportunity to reel in new customers—such as Coke fans, who may not even enjoy McDonald’s food – but may start crossing over the thresholds just to see if their favorite beverage does indeed taste better there. The digital marketing world is expecting more creativity from McDonald’s in 2018 to stand head and shoulder over other brands and eventually drive more revenue. The Fearless Girl is one of the best creative marketing examples of 2017 that stole hearts the world over. 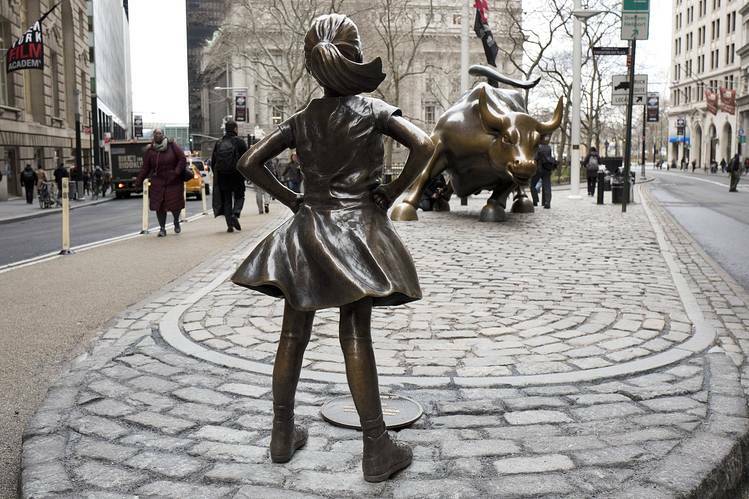 The bronze sculpture of a girl, hands on her hips, facing the Wall Street’s iconic Charging Bull statue, was installed in the middle of the night on March 7thin the wake of the International Women’s day and was quickly embraced as an emblem of female empowerment and gender equality. At just over 4 feet and weighing 250 pounds, the figure is surely no competition when it comes to her petite size, but her upturned face and fierce hands-on-hips stance leaves no doubt that she’s more than a match for him.The statue went viral, garnering plenty of attention from brands and people all around the globe. It received more than 1 billion Twitter impressions in the first 12 hours and reached 4.6 billion Twitter impressions in 12 weeks with the hashtag #FearlessGirl. The real-life social experiment by Heineken successfully achieved what the Pepsi ad failed to demonstrate. The series of ads is a great inspiration for brands looking for ways to elevate their brand to a broader appeal. The poles apart Ads put together two real-life strangers, divided by their beliefs and meeting for the first time. Heineken is looking to prove that when people learn to see past a label, even the most divided groups can find common ground and come together (hopefully over a pint of beer). In a world where we seem to be residing in a social media echo chamber, the film shows that instead of trolling online, you can leverage the power of actually connecting with people in person. The 80’s style Netflix series“Stranger Things” has taken the world by storm. Kelloggs took steps to make the most out of Eggo’srecurrentappearances on the Netflix series. The brand has come up with an amazing idea of Stranger Things themed recipes to complement all the episodes of this season. The brand also sent an Eggo Waffle Truck at the show’s premiere in Los Angeles. Instead of subtly placing the brand in the series, the brand created something that is totally authentic and inspiring, cleverly making their product an intrinsic part of the series. They embraced the power of social media to build this connection. KFC decided to cleverly echo its original recipe’s secret formula of 11 herbs and spices. A Twitter user @Edgediscovered that KFC’s official Twitter account only follows 11 people – six named herb and the five members of the pop band the Spice Girls. KFC and its creative agency Wieden+Kennedy’s Twitter trick clearly shows that brands can leverage the power of social media platforms in a cost-effective way that has the potential to go viral and garner a lot of attention. The brand got a lot of engagement without actually launching any type of paid advertising campaigns. This is a great example that shows how brands can create a direct connection with their followers who are closely following the conversation online. So, these are some clever yet inspirational marketing campaigns we have seen in 2017. Hopefully, in 2018, we will see more refined and brilliant advertisements that will generate the most impact and response. I’m sure these attention-grabbing marketing campaigns will surely inspire you and help you create out-of-the-box advertisements and marketing materials this year.